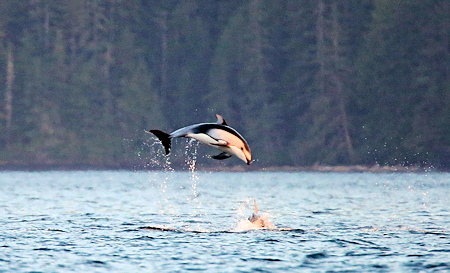 Spirit of the West Adventures, Vancouver Island. 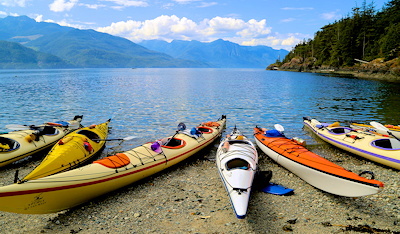 All-inclusive guided multi-day kayaking tours in BC's coastal paradise. 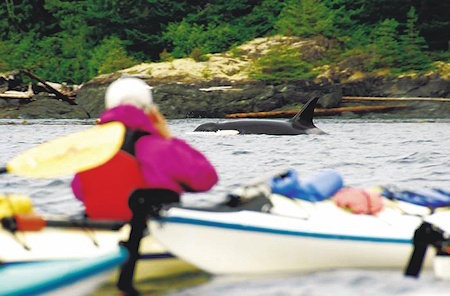 Kayaking BC is the ultimate way to view Canada's abundant wildlife! LEVEL: All levels of experience and abilities. Everybody can join our tours - Call us and find the best tour for you! 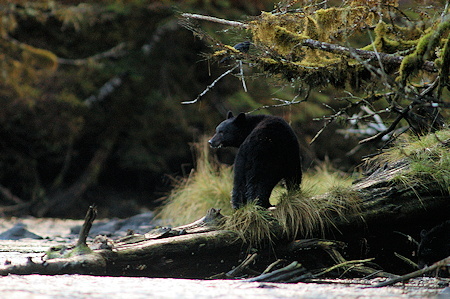 HIGHLIGHTS: Wildlife viewing at its best, kayak the realm of the whales, hundreds of small islands for exploring around Vancouver Island and BC's coast, First Nations culture and history, stunning remote camp sites & gourmet camp food, hot shower and hot tub at our base camp overlooking the Pacific Ocean and so much more! RATES: Pricing starts from CAD $895 for a 4-day tour. Check out all our rates and current specials. 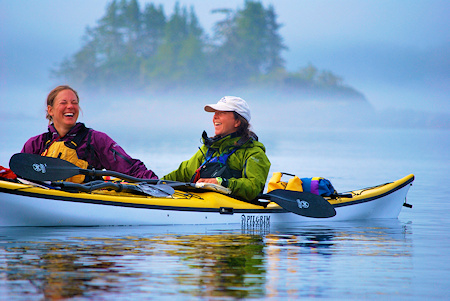 We want you to fall in love with kayaking and our unique coast, and our passion shows in everything we do. 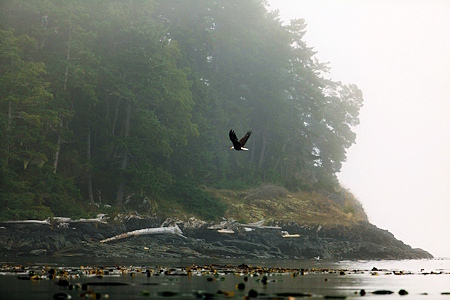 Choose among several professionally-guided 4-8 day trips for all experience levels around Vancouver Island. 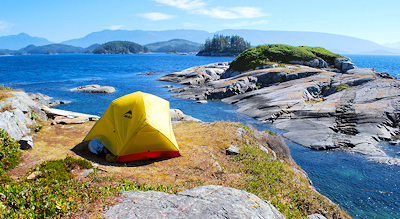 'Glamping' base camp-style with wood-fired hot tub overlooking the Pacific Ocean in Johnstone Strait or expedition-style paddling from camp to camp & paddling between 100 of island through the Broughton Archipelago, famous Desolation Sound, the wild Great Bear Rainforest on the Central Coast or through Nuchatlitz Provincial Park on the west side of Vancouver Island. 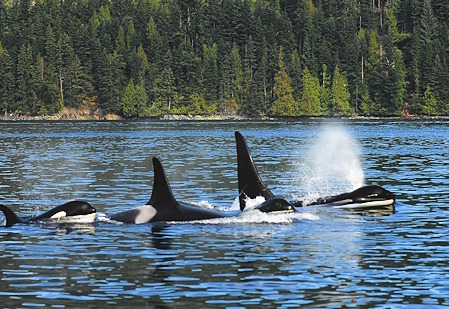 Savouring a fresh salmon BBQ in the open air, explore & view fascinating wildlife and wilderness and wake up on remote islands with the sound of the whales. 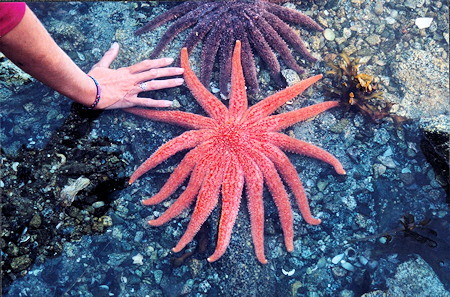 Unique and breathtaking. Our adventures are for everyone and are designed to cater to all levels of experience and abilities. We take care to introduce you to the sport in a fun and safe manner. All that we ask is that you welcome adventure with an open mind and are able to laugh and have fun when encountering the unexpected. Our groups are small, ranging from 8-13 people, depending on the trip, in order to provide you with the best experience possible. 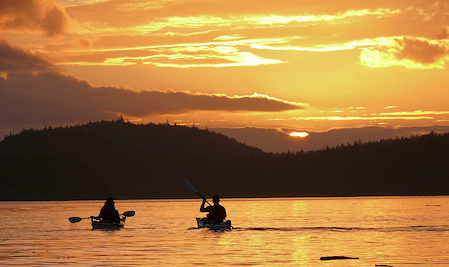 We provide everything you need for a once in a lifetime kayaking adventure. We provide high quality fiberglass kayaks, paddling equipment, camp cookware, eating utensils, and camping gear. Our guides take care of you for the entire duration of your tour, prepare delicious, organic & local meals. All of them have extensive training & experience in sea kayaking and in sharing the natural and cultural history of the area.